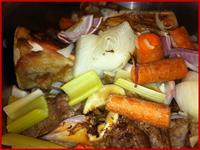 Beef Stock or Beef Broth? The age old question: can I substitute broth for stock? The answer is a qualified yes, in most dishes. It is important to know what you are giving up in flavor in exchange for convenience. If you follow the steps in this recipe, you will be astounded at how deep and delicious the flavors are and will wonder why you ever considered using store bought. Place the pan in your oven and set the timer for 10 minutes. After just 10 minutes you will notice how the meat on the soup bones is already beginning to carmelize (the beginning of the first flavor layer). Carefully turn the meat at this time. 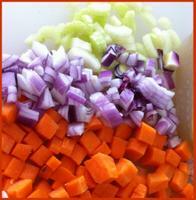 Now layer the onions, carrots and celery (sprinkled lightly with olive oil) on top of the meat. Return to oven for 30 minutes, turning the meat once more. The next step is to move the carmelized meat and vegetables to the top of the stove. If you used an oven-proof soup pot, just place the hot pot on the stove. If you used a pan, very carefully move the bones and vegetables to your soup pot. Please remember that the pan from the oven is extremely hot! 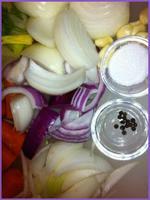 Fill the pot with cold water, covering the bones and vegetables completely. Bring the stock to just the boiling point and then turn it down to a slow simmer. Simmer 3-6 hours, checking the liquid occasionly; you may add additional water during the first two hours. (we just use a large plastic strainer for this step since the pieces are large). You may discard everything, or you may want to pick the little pieces of meat out for later use. 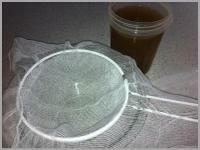 Using a mesh strainer covered with cheese cloth, strain the liquid. 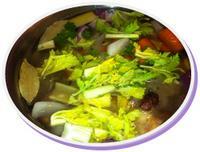 You now have a rich, flavorful stock for use alone, in soup, sauces or gravies! If not using in a recipe immediately, store in the refrigerator or freezer in quart or half quart containers. When you open the lid of your stock after refrigeration you will notice a solid mass of white covering the top; this is beef fat which can be used in place of butter for delicious gravy. And the lovely stock will have turned into a thick gel which, when heated turns back into a lovely liquid! Before you even taste it, you can see the beautiful texture and goodness. . .extra time? You bet! Worth it? Definitely! Good Job!